I took a walk last week down the stream (Crystal Springs Creek) at Westmoreland Park to set up a photo point monitoring site there and to get a few pictures for the CSCC website and photo references for my illustrations. Photo monitoring is a method of keeping track of changes in landforms and vegetation over time, and I have a project of collecting repeatable photos of as many points on the stream as I can before the duck pond at Westmoreland Park is removed next summer (2012) and the next set of culverts are replaced about the same time. These photos are seldom scenic, but are repeatable for comparison. left: Water ponded upstream of undersized pipe culvert at SE Glenwood St., just north of Westmoreland Park. This culvert is slated for removal within a year or three. After the duck pond is replaced with a stream channel and wetlands and the undersized culverts are replaced with larger box culverts or bridges, both the overall appearance and the hydrology of the creek will change. The undersized culverts slow the current on the upstream side and cause siltation of the streambed as well as ponding and warming of the water. 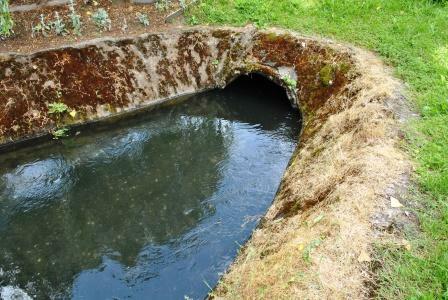 Within the pipes the current is accelerated, causing scouring of the streambed near either end and making it difficult or impossible for juvenile salmon to pass upstream. The replacement of these culverts and the removal of the duck pond at Westmoreland Park should go a long way towards restoring Crystal Springs Creek as salmon spawning and rearing habitat, but not all the changes are entirely predictable. In any case I think a good set of before and after photos is warranted. right: Crystal Springs Creek where it enters the duck pond at Westmoreland Park. Note the collapsing concrete liner and Great Blue Heron. Most of the pond is no deeper than a heron can wade, which contributes to it's temperature problem in the summer (too hot for salmon). left: Overfed Domestic Swan Geese (Anser cygnoides) and hybrids at the duck pond. Note the total lack of vegetation along the shore here due to feeding and trampling by ducks and geese. Also note the decrepit concrete liner falling into the water. It really smelled terrible here. Please do not feed the waterfowl! right: Damage to picnic area west of duck pond. The grass is cropped to about half an inch and the ground is covered with droppings (difficult to convey in a photo, but try leaning close to your monitor and sniffing the image). I probably will not do an illustration of any goose droppings (but who knows). Luckily for you, the damage is much more apparent in person (you’ll bring some home on your shoes) than in photos. What I did find, at the south end of the park, is a fair diversity of plant species growing near the stream, and I will show you some of this instead. left: South of the duck pond things look a lot better in the vegetation department. Here we see western redcedar (Thuja plicata)and weeping willow (Salix babylonica) which are both good riparian shade trees. The willow is not a native variety, but my guess is it does more good than bad for the creekside habitat. The understory here is mainly rushes (possibly Juncus effusus, the common rush) and a jewelweed (Impatiens capensis or possibly Impatiens noli-tangere, based on details of the leaf tips and pigmentation on some blossoms). The former was probably planted by the Parks Dept., but the latter spreads readily by seed along stream banks. Impatiens noli-tangere is a native here in the west (and in Eurasia) but it's cousin the orange jewelweed (I. capensis) is introduced here from east of the Rockies. This specimen could be either variety or a hybrid, the descriptions are so similar and these plants had some characteristics of each. left: Blossoms of the jewelweed. Note that, like an orchid, the nectary is way in the back and the anthers (pollen-bearing structures) are poised overhead in the front, waiting for the next bee. The seed pods are the fun part. As they mature they develop spring tension in the flexible case, and spread their seeds by bursting when disturbed. The riper they are, the less provocation they require. Botanists call this attribute explosive dehiscence, and there are other plants along the creek that share it with the jewelweed. right: Seed pods of jewelweed (and a ladybug larva). The fatter they are the better they pop! left: Jewelweed pod after explosive dehiscence. Imagine a banana peel made of sections that really wanted to curl up on their own until it peeled itself and spit out the banana. Five seeds in this pod. right: Reed canary grass (Phalaris arundinacea) growing in the stream channel. There is some debate as to whether this species is native to some parts of North America or not, but in wet places of the Pacific northwest it is definitely an aggressive invasive. It spreads by seed and by rhizome (underground stem) and will form dense monoculture stands that preclude other species from gaining a foothold. It is difficult to eradicate once it has formed a large stand. This little clump probably grew from a fragment that broke off a larger bunch upstream and snagged on a submerged branch here. left: Douglas spirea (Spiraea douglasii). Native, has lovely pink blooms earlier in the season, here gone to seed. right: Quercus garryana, the Garry Oak or Oregon White Oak. You don't think of oaks as doing well so close to water but there are several mature specimens of this species on the banks of the duck pond that look quite healthy. Well, I haven't shown all of the interesting plants I saw on my walk, but I hope I have shown a little of the variety along a short stretch of Crystal Springs Creek. One or two of the subjects will surely be depicted in a future illustration or rubber stamp of mine (link to my illustration website). Noticed my first Belted Kingfisher in a while on lower Crystal Springs Creek earlier today. They’ve been absent recently (nesting in the banks of the Willamette, Johnson Creek or the Clackamas, maybe?). Or perhaps I just haven’t been paying attention. Anyway, I’ve missed them and it was nice to hear that classic ratchet in the air this morning—a wakeup call to me and a warning to sculpins and sticklebacks. So welcome back to an iconic bird of Crystal Springs.